As I was reading about North Korea over the past few weeks, I thought it would be interesting to get a little bit different perspective on the country. Megan from Algonquin Books set me on the trail of VeryMuchSo Productions, a documentary film crew who has made at least three different documentaries about North Korea.Their 2002 documentary The Game of Their Lives follows the 1996 World Cup soccer team from North Korea, and A State of Mind in 2004 tells the story of a pair of North Korean gymnasts. 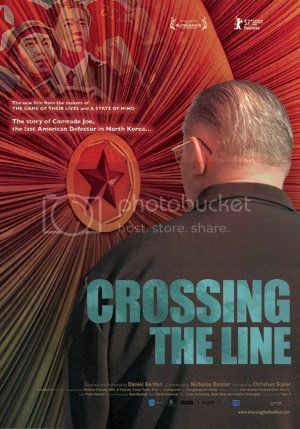 Both sounded fairly interesting, but when I came across VeryMuchSo’s 2006 documentary, Crossing the Line, about 0ne of the four US soldiers stationed in South Korea who defected in the 1960s, I knew I’d found what I wanted to watch. James Dresnok was the second US soldier to defect to North Korea, and is the only one left alive in the country. By now he has been in North Korea more than twice as long as he ever lived in the United States. Dresnok allegedly had a very tough childhood, that seems to have turned him into a troubled young man. His first marriage ended when his wife cheated on him during one of his tours in Korea. When he returned to South Korea, based on how he tells his own story, he acted like a petulant, defiant teenager. When his commanding officer refused to give him a pass, he forged one and when he was on the verge of being brought up on charges, he simply walked across the DMZ into North Korea to avoid taking responsibility for his actions. Although there are conflicting stories about some of the things that have happened to Dresnok over the past 50 years in North Korea, even the opposing stories offer an instructive look into life in North Korea. For one, the accusations that the brides of all four American defectors were women brought to North Korea against their will. Of the two women still alive (neither of which was Dresnok’s first wife in North Korea, his second of three wives total), one claims that she simply came to North Korea as a tourist and fell in love, but the other has said that, although she came to love her husband, she was in North Korea because she had been kidnapped from Japan. Crossing the Line is a fascinating hour and 1/2 view into American defectors and the lives they have lived in North Korea. It is not a topic that would have ever occurred to me, people defecting TO North Korea instead of FROM North Korea, but it has happened and is an instructive phenomenon to study. If you’re interested in North Korea, Crossing the Line is definitely worth checking out. It is currently streaming on Netflix.